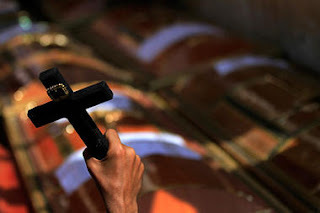 Coptic Christians in Egypt, already dealing with a massacre, are now contending with the state-run version of events, which has convinced many Egyptians that Christians were at least partially responsible for the violence. Egypt’s muted response to a deadly attack by its own Army on a Christian protest Sunday is furthering the anger of Christians, and threatening to escalate sectarian strife at a delicate time of transition. Government officials have portrayed Sunday’s events as a clash with violent protesters provoked by “hidden hands” to “meddle with the country’s security and safety.” Protesters say their demonstration – protesting a recent attack on a church in southern Egypt as well as the Army’s dispersal of a protest the week before – was peaceful when it was attacked. At least 17 Christians died; most had gunshot wounds and signs of being crushed by vehicles. While many Muslims joined Christians in mourning the victims Tuesday, others are still convinced that the Christians were the aggressors. Boula Zakie, who was hit by an Army vehicle during the attack, said he has received dozens of phone calls from Muslim friends asking why Christians attacked the Army. “They don’t believe us,” he says. One of his friends was killed in the attack and another is in critical condition. Egypt’s finance and deputy prime minister, Hazem al-Beblawi, tendered his resignation Tuesday over the Army attack on Sunday, but reports in state media said that it was rejected by Field Marshal Mohamed Hussein Tantawi, Egypt's military ruler. Mr. Beblawi could not be reached for comment. The cabinet also promised to implement within two weeks a law that would ease building restrictions on churches, an area where Christians have long been discriminated against. But coming after witnesses said the Army opened fire and drove vehicles into a crowd of protesters, such measures are being rejected by many Christians. Few believe that a fact-finding committee ordered by the military will hold responsible those who killed the protesters. Thousands of Copts and Muslims directed intense anger at the military after the funeral of some of the victims Monday, chanting angrily for the removal of Field Marshal Tantawi. Some political parties have also blasted Egypt’s military council, which is ruling Egypt during the transition from the rule of former President Hosni Mubarak. The state television reports spurred hundreds of Muslims to take to the streets, armed with sticks, to defend the Army against what they thought were armed and violent Christians.